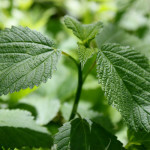 Nettles, also known as Stinging Nettles, are delicious and versatile wild plants. 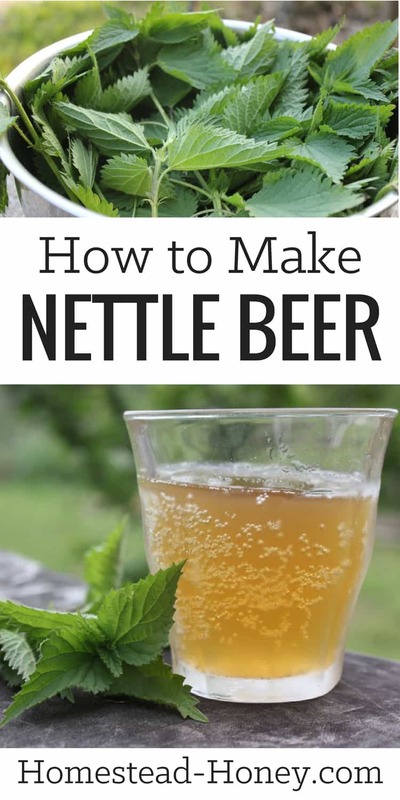 Their signature sting disappears when the nettles are cooked, so they can be harvested as greens, drunk as a mineral-rich tea, or even used to make this delicious nettle beer recipe. 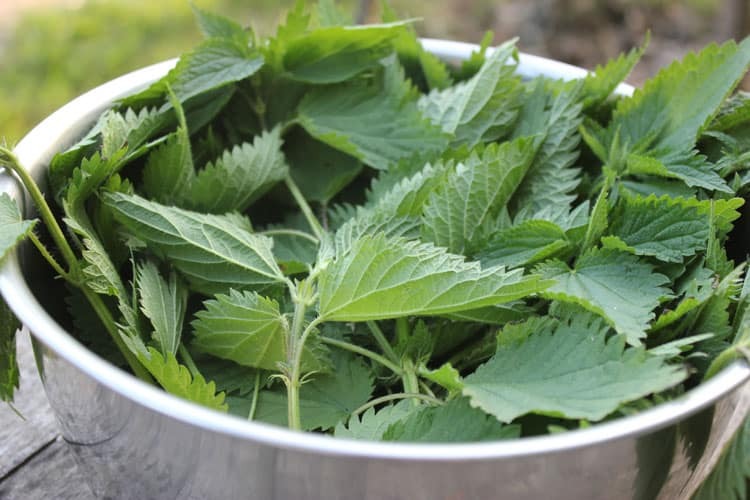 Although nettles are so widely distributed that they are easy to wild harvest, when we arrived on our homestead, we could not find any stinging nettle, although we were wildly successful in foraging for wood nettles. I started some stinging nettles (Urtica dioica) by seed and planted them in a few moist and shady spots. 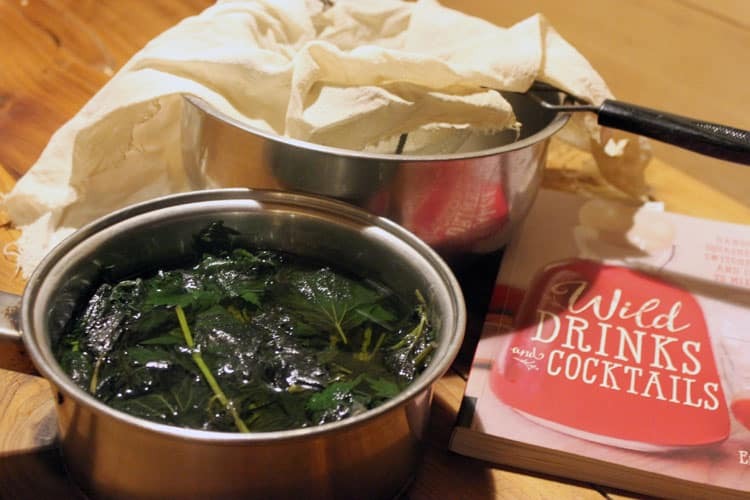 When I received a copy of Wild Drinks and Cocktails, by Emily Han, I was immediately drawn to the nettle beer recipe. 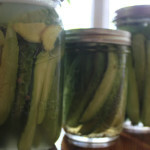 With plenty of nettles growing in the backyard, I harvested the tender tops and began making this simple fermented beverage. Here’s the recipe, adapted with permission from Wild Drinks and Cocktails. Step One: Harvest the top few inches of fresh nettles – you will need 8 ounces for this recipe (I made 1/4 recipe). Be sure to wear gloves to avoid getting stung! If you do not have fresh nettles, you can make this recipe with dried nettles. Step Two: Place the nettles and water in a pot and bring to a boil on the stove. Reduce the heat and simmer, uncovered, for 15 minutes. Step Three: Line a strainer with a fine mesh cloth (cheesecloth will work great) and strain the nettle liquid into a large bowl or crock. Be sure to squeeze the cheesecloth to extract all of the liquid from the nettles. Add the sugar and stir to dissolve. Cool the liquid to room temperature and then add the lemon juice, then sprinkle the yeast on top of the liquid. Cover the bowl or crock with a towel and let it sit at room temperature, out of direct sunlight, for three days. Step Four: After three days, strain your nettle beer through a fine mesh sieve and funnel it into bottles, leaving at least one inch of headspace. We like to reuse Grolsch beer bottles for this purpose (you can sometimes find them at thrift stores, or on Craigslist). The author advises placing the beer in cool storage for one week and “burping” the bottles daily. However, we opted to not burp the bottles to maximize carbonation. If you do not burp the bottles, be sure to check on them daily to ensure your bottles will not over-carbonate and explode! Step Five: After one week, transfer to the refrigerator and drink within one year. 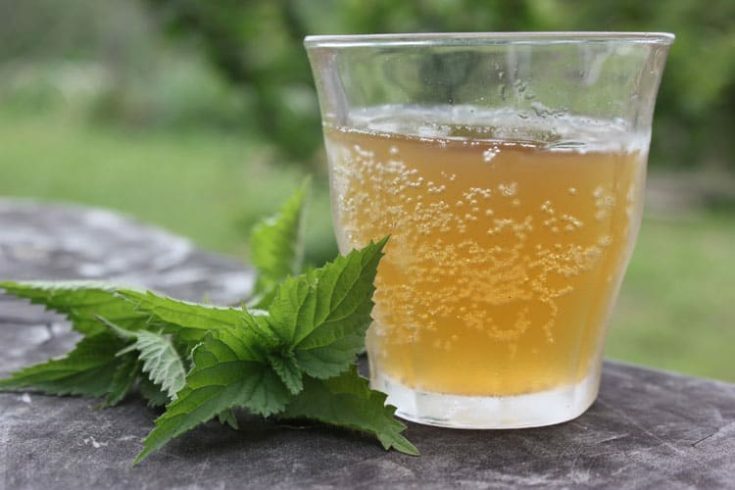 Enjoy the lemony-tangy refreshing flavor of your homemade nettle beer! If you’d like to try your hand at making other wildcrafted and seasonal beverages, check out my posts on how to make homemade soda and how to make shrubs, and my book review of Wild Drinks and Cocktails (and other inspiring homesteading books!). Tangy and mineral rich, this wild harvested and fermented nettle beer recipe is a delicious drink, reminiscent of hard cider, and easy to make at home! Harvest the top few inches of fresh nettles – you will need 8 ounces for this recipe (I made 1/4 recipe). Be sure to wear gloves to avoid getting stung! 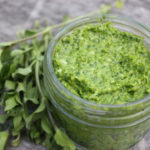 If you do not have fresh nettles, you can make this recipe with dried nettles. Place the nettles and water in a pot and bring to a boil on the stove. Reduce the heat and simmer, uncovered, for 15 minutes. 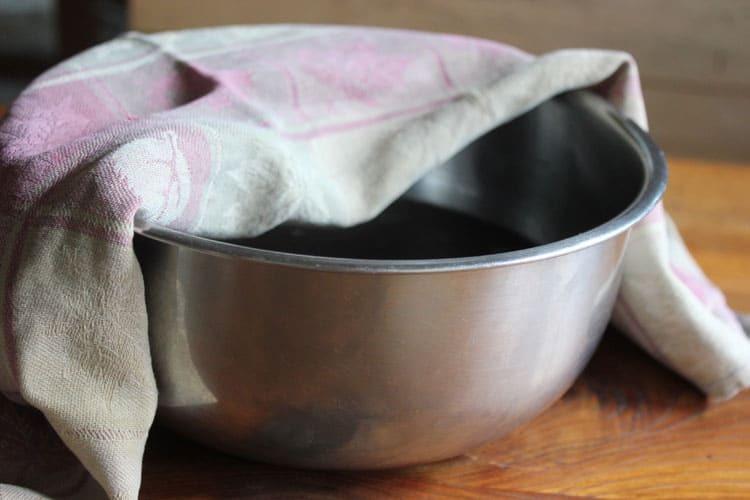 Line a strainer with a fine mesh cloth (cheesecloth will work great) and strain the nettle liquid into a large bowl or crock. Be sure to squeeze the cheesecloth to extract all of the liquid from the nettles. Add the sugar and stir to dissolve. 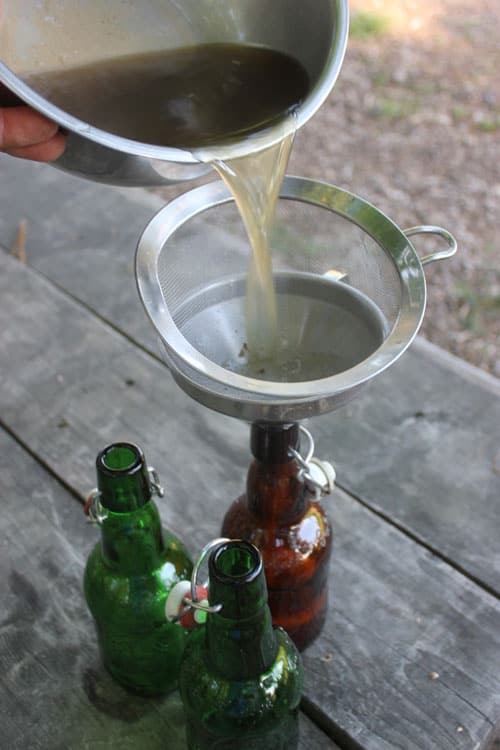 After three days, strain your nettle beer through a fine mesh sieve and funnel it into bottles, leaving at least one inch of headspace. We like to reuse Grolsch beer bottles for this purpose (you can sometimes find them at thrift stores, or on Craigslist). ﻿After one week, transfer to the refrigerator and drink within one year. Enjoy the lemony-tangy refreshing flavor of your homemade nettle beer! Hello! Is this an alcoholic beverage? Or might it be safe for kids? 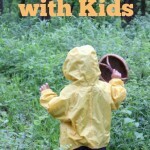 This particular recipe was very mild – I would have let my kids drink it. If you add more sugar and allow it to ferment longer, you will get a higher alcohol content. Nettle beer is a great countryside brew! I miss making it, I’ve not quite found a good source of nettles here or been successful in growing them! I try to make traditional English countryside brews each year. This year it will be elderberry wine! Yum! Have fun making the wine!